Instead of giving dear ol’ Dad a store-bought greeting card this Father’s Day, show him what he means to you by creating a one-of-a-kind card. Whether your dad is a joke fiend, has a passion for fashion, or a is a sucker for sentimentality, there is a unique DIY card for him. Printing your own adorable designs for Dad’s card is a quick and simple way to say “I love you.” These printables are filled with puns Dad is sure to love. You can find quality blank cardstock at your local craft store. Then, just glue your printed design to the card, and you have a great gift. You can add a personal touch to your Father’s Day card with hand-lettering and watercolor paint. Following this tutorial, complete with an instructional video and free templates, makes this DIY creative card an easy feat. This card is perfect for handy DIY dads. You can use a paper-cutting tool, like an X-Acto Knife, to cut out detailed tool shapes and perfectly straight edges. Things, Tings, and Chicken Wings! If you have little ones, this simple DIY craft is for you. Paint-stamped footprints make every card a meaningful and one-of-a-kind gift. Father’s Day Cards from Things, Tings, and Chicken Wings! Fathers and neckties go hand in hand, as it’s a fashion accessory dads almost always wear to work or formal events. This project will allow you–or your child–to design the ultimate tie for dear ol’ Dad. If this card isn’t your style, there are a few other cute shirt-focused crafts to choose from in this tutorial. This craft is kid-friendly and utilizes white fingerpaint to make the shape of a golf ball. Complete this cute card with a golf pun greeting, like “Have a ball this Father’s Day.” After all, the sport is a favorite activity among dads. Make a replica of your pop’s wallet with this handy DIY project. When he looks inside, he’ll find cool detailing and an adorable message from his number one creative child! Let’s face it–who doesn’t love tunes? This template will show you just how to make this DIY record player card, perfect for Father’s Day. A few supplies and some crafting concentration will show your dad a-rockin' Father’s Day. Dads, heroes–what’s the difference? Show yours just how super he is with this adorable card tutorial. This tutorial uses Cricut templates, but you can easily follow along using hand cut-outs if you don’t have one. This project requires a top-notch card making tool, the Cricut. Using different colored cardstock and the product’s templates, you can create this beautiful Father’s Day card from daughter to Daddy. It’s time to pull out that old watercolor set and put it to good use with this simple yet adorable Father’s Day card. This tutorial is complete with a video to show you just how to use simple supplies to make this beautiful piece of artwork. Colorful paint, sweet stamps, cork, and plaster are used in this multimedia card. Use your imagination to find the perfect colors and designs for this beginner craft this Father’s Day. You can easily find all the supplies needed for this DIY underwater card at the craft store, and you might already have what’s needed at home. This is a cute card using the art of collage to make an underwater scene complete with to father and child clownfish. Just add your own personal message to customize it! Proud parents, this one is for you. Create a fun ribbon design featuring your child’s photo for this DIY Father’s Day card. This personalized gift is sure to make Dad’s day extra special. This printable can be used year after year–a fun way to see your child’s growth in handwriting, vocabulary, and creativity as they fill in the blanks and draw pictures. Print this card on heavy card stock to make sure it lasts through future Father’s Days! Paper, scissors, and glue are the only supplies you need for this card. Well, maybe some folding skills, too. All ages will love making this simple bow tie Father’s Day card. Video tutorials make everything easier, and this one is no different. Anyone can flex their card-making muscles to make this DIY pop up card for Dad this year. He’s sure to be impressed by your crafting skills! This Father’s Day card looks professionally made, but anyone can make it using these detailed instructions and a few tools. There’s no way Dad won’t display this piece of art on the fridge. Gift cards are a great present for those dads who seem to have everything. Instead of handing it over in a simple sleeve, make this cool toolbox gift card holder to kick it up a notch. 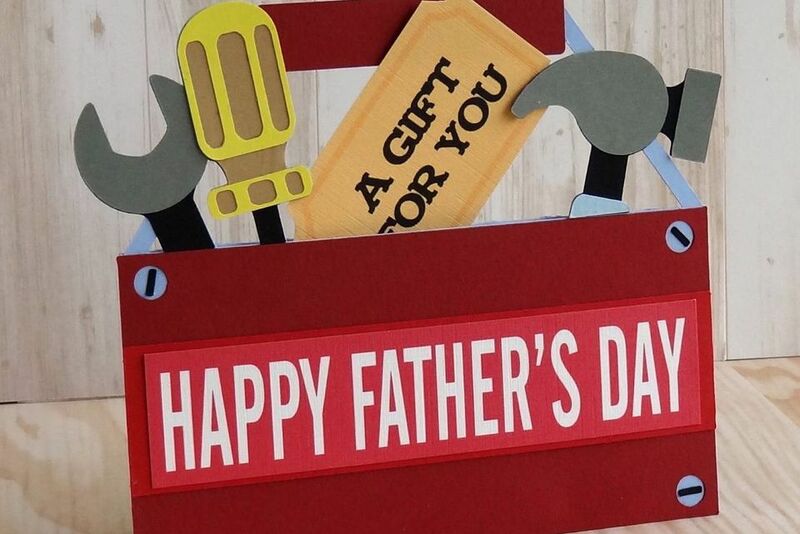 You can cut the tool shapes out yourself or use an automated cutting machine to make this Father’s Day craft easier.